Poultry workers were forced to endure unsafe and abusive conditions at an Alabama processing plant or lose their jobs, according to a complaint the SPLC filed with OSHA today. 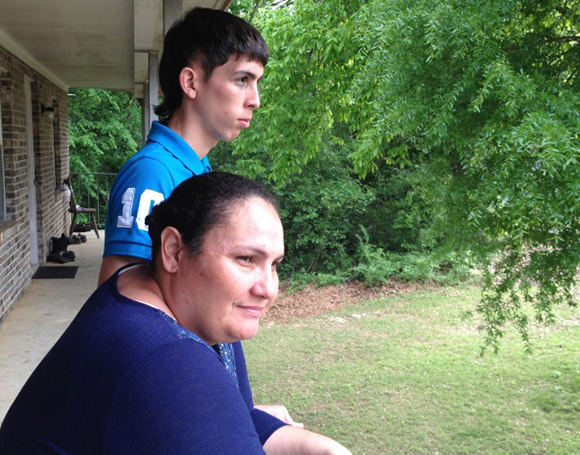 Beatriz Navedo began to feel dizzy as she worked a processing line at the Wayne Farms poultry plant. As the line zipped by, her chest also began to hurt. It was a heart attack. But Navedo wasn’t sure what was happening. She just knew she needed help. She went to the plant’s nurse, but the nurse wouldn’t call the hospital, instead offering aspirin. Navedo’s daughter, who also works at the plant, left her shift early to take her mother to the hospital. Both women were punished by having points added to their employee files. Workers who accrue too many of these points are automatically fired. The SPLC filed a complaint with the Occupational Health and Safety Administration (OSHA) today charging that workers at the Enterprise, Ala., plant have been forced to either endure unsafe and abusive conditions or lose their jobs. The complaint, filed on behalf of nine current or former employees, describes how workers are subjected to dangerously fast work speeds that cause disabling injuries, prevented from getting medical treatment and even fired for reporting injuries or taking time off to see a doctor. It also outlines how workers are required to pay the company for some of their protective equipment. They are even denied reasonable access to the bathroom, according to the complaint. Cristoffel Gonzalez was recruited by Employer Solutions Staffing Group (formerly East Coast Labor Solutions) while living in Puerto Rico. After arriving for work, he knew that he had been deceived by the recruiter and Wayne Farms. Gonzalez also had a family to support. After working at the plant for about eight months, he developed health problems, including pain in his hands and fingers due to the relentless processing line speeds. OSHA is charged with ensuring that employers protect worker safety and health across the country. The government agency, which is badly underfunded, is often the only agency that can ensure employers fulfill their duties. Alabama is the nation’s third-largest producer of poultry, but it comes at a high price for workers. Last year, the SPLC issued Unsafe at These Speeds: Alabama’s Poultry Industry and its Disposable Workers, a report that describes how Alabama poultry workers often suffer significant injuries and illnesses as they are forced to keep up with the punishing speed of processing lines. Based on more than 300 interviews, the report found that these workers – U.S. citizens and immigrants – are typically forced to endure dangerous conditions and silenced by threats of deportation and firing. Nearly three out of four Alabama poultry workers interviewed described suffering a significant work-related injury or illness, such as debilitating pain in their hands, respiratory problems, cuts, gnarled fingers and chemical burns. The report also shows that workers in the poultry industry suffer extraordinary rates of repetitive motion injuries that are directly linked to the punishing work speeds. The SPLC has fought to block a rule proposed by the U.S. Department of Agriculture that will increase evisceration line speeds from a maximum of 140 birds per minute to 175, despite ample evidence that work speed is a primary contributor to worker injuries. The SPLC has urged OSHA to address the unsafe working conditions by taking steps that include protecting whistleblowers and slowing the work speeds prevalent in the poultry and meat industries. Ensuring workers are treated as people means silence is no longer an option for Navedo. “I have to speak out because the way the plant supervisors treated us amounted to abuse and exploitation,” she said.